Christopher Bailey (Chief Creative at Burberry) showed up. But I was too late. So, there is nothing I can write about. Anna Wintour showed up too. And how she showed up! Of course well dressed, delightful and funny. Yes, she was funny. I couldn’t believe it. I expected a harsh and lame talk about „fashion business“ or „how to lead a print magazine into the next century“. But exactly the opposite happened. She was charming, her voice was warm and nice and she was talking „aus dem Nähkästchen“. Very sweet, indeed! e.g. Gucci used to be a „trashy flashy fashion house“ or „how she met one really famous designer“ (sorry, no names). After all these petite stories she told us to aim higher, step outside the mainstream, invest a lot of work in what you love and find interesting friends. Damn! She is so right, probably the most valuable thing in the word: Meet interesting people. I met one today. Will Smith showed up as Will Smith. What a great guy! More is not to say. 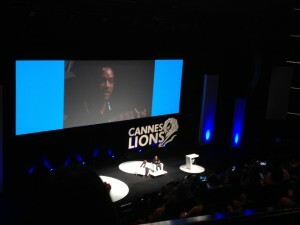 Live from Cannes – Pit Lederle.